Kang & Brooks have recently published an epidemiological study on scorpion envenomations in the USA between 2005 and 2015. 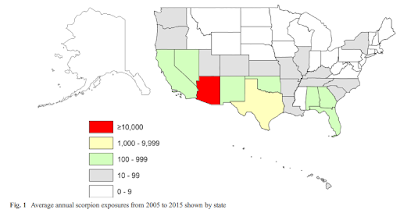 Introduction: Previous studies of scorpion envenomation in the United States (US) have focused on Arizona and the bark scorpion, Centruroides sculpturatus. Although many other scorpion species live in the US, information about envenomations in other states is lacking. Methods: Nationwide scorpion exposures from 2005 to 2015 were analyzed using the National Poison Data System. Results: Of the 185,402 total exposures, Arizona (68.2%), Texas (10.3%), and Nevada (4.2%) were the top contributors. However, six other southern states reported greater than 100 cases annually, primarily during the warmer months and evening hours. Envenomations occurred most often in a home (97.8%) and were typically managed on-site (90.1%). Pain was the most common effect nationwide (88.7%). Arizona had the highest frequencies of sensory, neuromuscular, and respiratory effects along with higher hospitalization and ICU admission rates, although the latter appeared to drop over the study period. In contrast, local skin effects such as erythema and edema were more common outside of Arizona. Children under 10 years of age in Arizona and Nevada had the highest rates of systemic effects, hospitalization, and ICU admission. Conclusions: Scorpion envenomations occurred throughout the southern US with similar seasonal and daily variations. Common clinical effects included pain, local edema, and erythema, except in Arizona and Nevada where severe systemic symptoms were more common. Systemic effects correlated with high rates of ICU admissions and intubations, especially in children under 10 years of age.